I have been waiting for the movie The Martian, starring Matt Damon, to hit the big screen ever since I read the book last year. The movie opened this weekend and I was sure to see it yesterday. I was not disappointed! 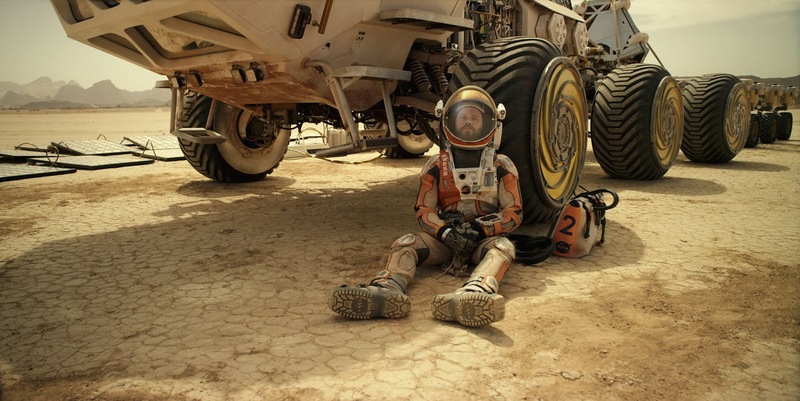 The movie tells the story of the first man stranded on Mars. He is the Robinson Crusoe of Mars, stranded with little hope of rescue and out of touch with NASA and earth who believe that he is dead. What happens is a resourceful story of pure survival. I especially liked the book and generally the movie because the underlying science is solid. I did not have to check my intellect at the theater door to watch the movie. The movie has a simple plot, how to survive when the odds are almost 100 percent against you. I was generally pleased with the film adaptation of the book. Obviously, the book is far more complex and in places more suspenseful. I'm not sure the movie crowd could handle the suspense of some portions of the book. Is the book better? You bet! Is the movie great! Definitely! The acting is exceptional and believable. The scenes are filmed and completely made me believe that I was on Mars. I believe that there is an academy award or two hiding in this movie. RECOMMENDATION: See this movie. Today! Yes, it is that good.